Maxxis introduces its latest high performance sport bike tire to its product lineup- the new Presa Sport MA-PS. It features an advanced tread pattern and distinct, angular profile to allow quick, precise, and responsive handling. The silica compound, formulated for optimum traction in dry and wet conditions, allows for cooler running temperatures and maximum grip on both the track and street. Further, the revolutionary radial carcass uses monospiral KevlarTM construction to maintain tire uniformity at high speeds. The new Presa Sport is a sport bike tire executing track day performance. 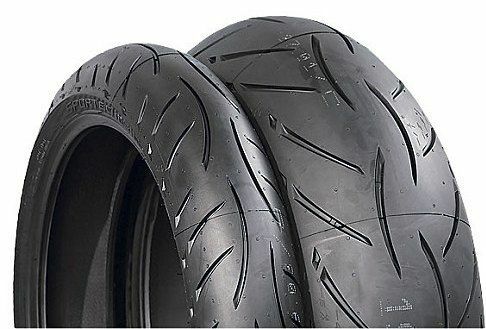 The Supermaxx has a distinctive profile and tread pattern which creates responsive handling and stability for quick and precise cornering. The revolutionary radial construction uses Kevlar belts to ensure tire uniformity at high speeds. The first 5 zone tension motorcycle tyre bearing an incredible level of tailored performance exactly where needed without discontinuity, making it the perfect all-round supersport tyre featuring patented Interact(™) Technology.